STATE IMPACT PENNSYLVANIA – Since the Marcellus Shale industry took off a decade ago, there seemed to be a consensus that Pennsylvania’s oil and gas companies would pay for the oversight — the time, personnel, and equipment state environmental regulators need to do their jobs. In fact, when the state Department of Environmental Protection raised well permit fees in 2014 to support its oil and gas program, Marcellus drillers were on board. 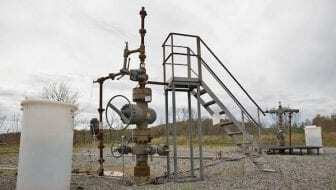 “We don’t believe taxpayers should be responsible for these costs,” Travis Windle, a spokesman for the natural gas trade group, the Marcellus Shale Coalition, said at the time. Fast forward to 2018: DEP’s oil and gas program says its workload is increasing as gas production continues to climb, but new well permit fees aren’t covering its costs. It’s proposing a 150 percent increase — permit fees for shale wells would climb to $12,500 from $5,000. The Marcellus Shale Coalition opposes the move, and it argues taxpayers should shoulder at least part of the burden. The group says its members pay for nearly all the agency’s oil and gas program, but it only accounts for part of the program’s work. An MSC spokesman declined to comment for this story and referred to an Aug. 10 letter the coalition sent to DEP. Coalition president David Spigelmyer wrote that the agency should distinguish between the costs it incurs regulating the conventional and unconventional (shale) industries. Four years ago, state legislators slipped language into a budget bill requiring the DEP to create separate oil and gas regulations for the Marcellus Shale industry and shallower, conventional drillers. Spigelmyer argued his shale group accounts for 60 percent of DEP’s work but shoulders nearly the entire cost. Instead, he wants the DEP getting at least some money from the state’s General Fund. It could be more than a year before the fee increases take effect. The review process will include oversight from legislators.